Novak Djokovic was finally crowned at Roland Garros after winning an encounter between top two seed over Andy Murray on Sunday to round up a career Grand Slam. He also came out the first to hold the four major titles at the same time since 1969. "It's incredibly flattering to know that Rod Laver is the last one that managed to do that, of course. There is not many words that can describe it. It's one of the ultimate challenges that you have as a tennis player," said Djokovic. "I'm very proud, very thrilled, obviously... I'm just so overwhelmed with having this trophy next to me that I'm just trying to enjoy this moment," he added. With the victory, Djokovic, who'd finished runner-up here for three times, beat the odd as the No. 2 seed had held a 6-2 win-loss record against the top one in the previous eight times when top two seeds met in the French Open finals. The world No. 1, who won 12 of last 14 matches against Murray, came from one set down to beat Murray 3-6, 6-1, 6-2, 6-4, though having committed a double fault before wrapping it up with a backhand unforced error from the Scot. 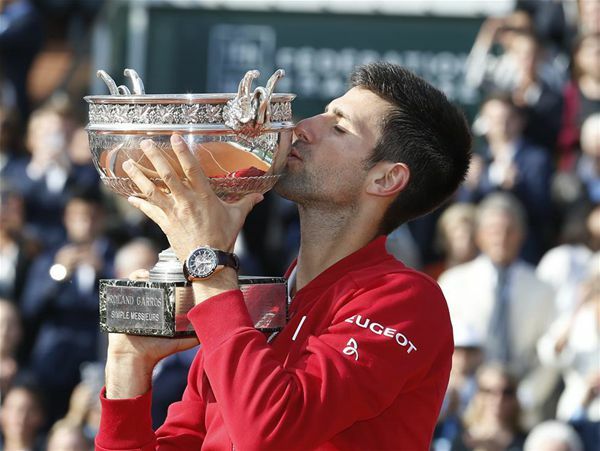 There came the sunshine right after Djokovic's title-taking victory after a rare French Open with many rain delays and even a washout in 16 years to mar the two-week long tournament. It took Djokovic three hours and three minutes to triumph the clay-court major and Murray, in a very close private relationship with the Serb, sent first-time congrats to his opponent. The 29-year-old Djokovic, who won a break in the very first game but was broken back in the next though having saved three break points, failed to hold his own game until 40 minutes into the final in the sixth game. Things went on the contrary direction in the second set, however, as the top seed broke Murray early to come up a 3-0 lead but missed two break points in the next to let the Scot pull one game back. Djokovic went further then, managing to hold his serve and again broke the Scot, who's just seven days older than the Serb, to lead 5-1 before serving to level the match with a 6-1 second set. In the third, the Serb, who hit almost every shot so deep that Murray was forced to run the full range of the court, broke twice against Murray' s none to make short effort of the second seed 6-2. With two love games in a row to lead 5-2 in the decisive fourth set, Djokovic failed to complete a serve-to-win eighth game, but managed to hold his nerve in his next serve game after committed a late break from Murray. The victory sent Djokovic on top on the list for the most attempts before winning the title here. "I entered the court quite prepared," said the Serb. "I needed a little bit of time to really find the right rhythm and start to play the way I intended, which happened in the beginning of the second and practically till 5-2 in the fourth set. It was flawless tennis. "I really felt like I played on a high quality and putting a lot of pressure on Andy's serves and just trying to hang in there," he added. Murray, despite the fact that he lost at the last step in his sixth attempts at Roland Garros, didn't feel depressed at all and gave all possible credit to his opponent. "At points I did well. Not necessarily the whole match," he said. "He did play extremely well. Gave me very few errors. Started hitting the ball a bit close to the lines, and I was sort of dropping a bit far back behind the baseline. "Against him, obviously if you're letting the best players control points, that's tough. I wasn't able to dictate enough points after the beginning of the match, and made it tough," he added. Novak Djokovic joined the tennis greats yesterday when he downed British second seed Andy Murray 3-6, 6-1, 6-2, 6-4 to claim his maiden French Open title and hold all four grand slams at the same time.